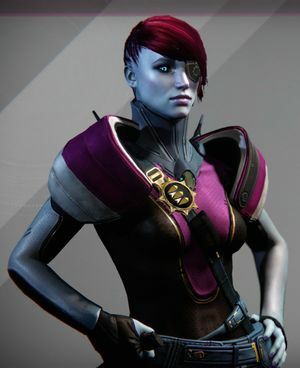 Acting Regent-Commander Petra Venj, formerly the Queen's Emissary, is an Awoken vendor and member of the Royal Awoken Guard for the Queen of the Reef. She is the story agent for the House of Wolves expansion. She sells emblems, shaders, ships, and the Vestian Dynasty for those who have gained favor with the Queen by completing Bounties and hunting for Wanted Fallen. Petra can be found in the Vestian Outpost in the Reef. In Destiny 2, she acts as the destination vendor for the Dreaming City. "My lady, I offer again the only explanation I can: I did not know the Guardians would act as they did. All I had known, all I had ever known, were the ways of the Awoken." Petra was raised on Amethyst by the Techeuns. When the settlement was attacked by the Silent Fang during the Reef Wars, she became one of the Queen's Corsairs out of a desire for revenge. She made a name for herself during the Hildean Campaign as an accomplished soldier. Her pride eventually led her to make a devastating career failure; during the hunt for Veliniks, the Ravenous, she called in an airstrike that resulted in three strike teams of Guardians dead. With City-Reef relations deteriorating, Queen Mara demoted Petra to Emissary and exiled her to the Last City. Petra was uncomfortable living in the City, regarding its inhabitants as ignorant of their place in the world. After years of exile, she pleaded with the Queen to end her exile and allow her to return to the Reef. "Last week I was delivering court messages. Today, we're delivering explosions! I love fieldwork! Get after them, Guardian." After the Queen aided a Guardian in acquiring a Vex Gate Lord's eye to enter the Black Garden, Petra was allowed to return to the Reef. She was stationed at the Vestian Outpost to serve as an emissary between Guardians visiting the Reef and the Queen. She met with the Guardian who the Queen had aided and tasked them with killing Draksis, the Kell of the House of Winter and a thorn in the side of both the Reef and Last City. While the Guardian was accomplishing that task, Skolas escaped from the Nine and broke many of his followers out of the Prison of Elders. Most of the House of Wolves then rebelled against Queen Mara and fled the Reef. Petra was stunned by the return of Skolas, noting that Queen Mara had assured the Reef that he would never be seen again. The Queen ordered Petra to report to Uldren Sov to see what his Crows had learned, and Petra vowed not to rest until the hunt for Skolas was done. When the Guardian returned after killing Draksis, Petra informed them of the rebellion and ordered them to head to Venus to prevent Skolas from taking control of the now leaderless House of Winter. Despite the circumstances, the hunt for the Wolves invigorated Petra, and she was eager to oversee the operation to take down Skolas. She directed the Guardian to destroy the House of Winter's heavy artillery to prevent the Wolves from utilizing it. The Guardian discovered Skolas had subjected the House of Winter already, and found him making a speech. Petra ordered Variks to translate, and he informed them that Skolas had declared himself Kell of Kells. Skloas managed to escape, but a number of his followers were killed by the Guardian. Petra detected a mysterious Vex signal amongst the Fallen and ordered the Guardian to return to the Reef. She reported these events to the Queen, who was displeased that Skolas had escaped and earned the loyalty of another Fallen house, but Petra assured the Queen she had a plan to track down Skolas. Petra asked the Guardian to gather shiplinks from Fallan Vandals on Venus, which Variks then used to track the Silent Fang to the Cosmodrome on Earth, where they were hunting the leadership of the House of Devils to make their takeover easier. She dispatched the Guardian to eliminate the Fang, working with Varkis to guide the Guardian to them. As they did so, Petra explained her own history with the Fang and speculated that they had helped Skolas escape, but wondered how they could have freed him from The Nine. Once the contingent of Fang sent to eliminate the leadership of the Devils was exterminated, Petra congratulated the Guardian and informed them that she bet Skolas would attempt to recruit the House of Kings next. Although the Fang were weakened, they were not compleately eliminated, and Petra was ordered to set bounties on the remaining members by the Queen. Traveling to the Hull of Crows, Petra met with Prince Ulden Sov, Paladin Yasmin Eld, and Techeun Shuro Chi to discuss what the Wolves and Kings were planning. Ulden revealed that two King Barons, Vekis and Paskin, had been sent to meet with the Wolf Baron Yavek, but was certain that the Kings would never bow to Skolas. Petra was skeptical of the Prince's certainty, wondering what would happen if Skolas somehow proved to or tricked the Kings into believing he was the Kell of Kells. The Prince dismissed her concern and claimed nothing short of the Traveler proclaiming Skolas Kell of Kells would blunt the Kings' ambition, and Petra noted that he seemed to admire them. Petra asked if she could place bounties on the King Barons, but Ulden suspected they would do their work for them, guessing that the King Barons were actually assassins as the Kell of Kings would never bow before Skolas. When the Guardian arrived on Earth to halt the meeting, Petra lost communication with them due to the Wolves High Servitor's jamming. However, the Guardian successfully eliminated the jammers and killed all three Fallen Barons during their meeting on Earth. Petra noted that while this was a major blow to Skolas, the House of Kings was still powerful despite losing two Barons. "This isn't just a hunt. A Fallen House with Vex technology is a threat to the whole system." Petra soon received a report from the Crows that Skolas and the Wolves had retreated back to Venus and were fighting the Vex. She also began to gain a great deal of trust in Variks, and enjoyed running the operations with him. Petra questioned Variks if there were any other Fallen Houses in the system that Skolas would try to recruit. He noted the Exiles on the Moon followed no one and would remain independent. She then asked about the House of Rain that Variks had mentioned when discussing the prophecy about the Kell of Kells, and he informed her that the House was destroyed in the Whirlwind and that only he kept their records and prophecies. Variks revealed that few had tried to become Kell of Kells, with House Judgement being the closest to peace the Fallen knew, and Petra joked that maybe he was the true Kell of Kells. When the Guardian returned to the Reef, Petra informed them that the Wolves were now on the run and losing forces and directed them to speak with Variks for their next assignment. Upon discovering that Skolas and his followers were attempting to break into the Vault of Glass, Petra believed that the Kell had either gone insane or had a terrible plan in the works, either of which meant that they had to end the Wolf Rebellion quickly. The Guardian prevented the Fallen from using Oracles in the Vault as a tap into the Vex network, although Petra and Varkis agreed that the hunt for Skolas had to end now before he acquired Vex technology and became a threat to the entire system. When the Guardian returned to the Vestian Outpost, Petra admitted that despite the severity of the situation this was the most fun she had in years. Tracking Skolas to the top of the Vex Citadel on Venus, Petra was ordered by Queen Mara to have the would-be Kell of Kells captured alive. Petra stood by with a task force of Crows to capture Skolas once the Guardian subdued him. As the Guardian fought to reach Skolas, Petra and Variks speculated about the Kell's intentions, with Petra believing he wished to outfit the House of Wolves with Vex weaponry. When they found Skolas at the top of the Citadel, they realized he was attempting to bring all of the House of Wolves from across time into the present. The Guardian managed to defeat Skolas, and Petra arrived and captured the broken Kell and informed the Guardian the Queen had a message for them. Once Mara finished thanking the Guardian, Petra commented that she almost felt sorry for Skolas' future "conversation" with the Queen. She left to deliver Skolas to the Queen and asked the Guardian to meet her in the Reef to be rewarded. Upon their arrival, Petra thanked the Guardian for their work and was pleased with how fun the hunt was. She awarded the Guardian with a Vestian Dynasty as thanks and prepared to return to the field once more, and also swore that she would work together with them again in the future. Following the defeat of the Awoken Fleet at the hands of Oryx, the Taken King, a grief-ridden Petra was appointed to the position of Acting Regent-Commander of the Reef in the wake of Queen Mara Sov's apparent death. She would then go on to assist in the Taken War by assisting Variks and a fireteam of Guardians with tracking down the last remaining holdouts of the House of Wolves and offering bounties on Taken leaders and troops. A year after the Red War, Petra was sent to handle a breakout in the Prison of Elders alongside Cayde-6 and the Guardian. She helped kill many of the hostile prisoners, where she advanced into the Prison, ultimately being confronted by Uldren Sov - the now-revealed leader of the Scorn. Cayde-6 was shot and killed in the altercation, and Uldren Sov quickly fled the scene alongside his eight Barons. Following Cayde's death, she helped the Guardian make a deal with The Spider to find Uldren and his Barons. She later tracked Uldren to the Shard of the Traveler in the EDZ, but was discovered and forced to flee. She finally helped the Guardian pursue Uldren to the Watchtower, at which both she and the Guardian killed Uldren. After his death, she established her base of operations within the Dreaming City. While in the Dreaming City, she enlisted six Guardians to enter the Keep of Voices and kill Riven, of a Thousand Voices, the last Ahamkara. After the Guardians freed the Techeuns Kalli and Shuro Chi, and killed Riven, the Ahamkara unleashed a curse on the Dreaming City. Petra then rallied Guardians to stop the Taken from looting the Dreaming City and preventing the Taken from taking over the Oracle Engine. Petra has visions of many different things, as noted by Variks. Some of these dreams feature the Traveler and the Black Garden. Since becoming Acting Regent-Commander of the Awoken, Petra has been under constant duress as she hated the burdens of leadership. She blames herself for many of the disasters that have befallen the Awoken, such as the Prison break at the Prison of Elders, Cayde's Death, Riven's manipulation, and the curse on the Dreaming City. However, Petra continues to hold out as Regent-Commander, showing a stoic attitude towards the many threats that befall her and her people. Petra holds a great deal of trust and respect for the Guardian, acting very eager to work with them in their missions together. She heavily enjoyed doing field work with the Guardian during the Wolf Rebellion and not being assigned as the Queen's Emissary. Petra was also among the first to help the Guardian's personal mission to avenge Cayde, having similar feelings to have Uldren Sov pay for his crimes. Petra was also willing to divulge some of the Awoken's deepest secrets to the Guardian, showcasing her faith and trust in them. First and foremost, Petra is loyal, if not devoted, to her Queen, Mara Sov, following her commands without question or hesitation. While she practically begged to her Queen to be allowed to return to the Reef, she remained bound to her duty in her assignment as the Queen's Emissary after her previous actions soured relations between the Reef and the Last City. Thus she was desperate to redeem herself in the eye's of her Queen and be of use to her. Upon Mara's presumed death at the start of the Taken War, Petra was almost consumed with sadness and if not for Variks's and the Guardian occupying her time with the Wolf situation on Mars, Petra would've been lost in her mourning. When she finally made verbal contact with Mara years later, she was elated and relieved. "Variks has his uses, but be careful. He holds many alliances, too many." "I dreamt of your Traveler last night, shining through the window of my pod. Like a great white moon." "This used to be a Fallen ship, before the Scatter." "The Wolves spread far a wide, beware Guardian." "Don't worry, your ship is safe." "How's the hunt treating you, Guardian." "The Reef can be a maze if you're not used to it." "We're still rounding the rest of Skolas's allies. Up for some hunting?" "Ready for some hunting, Guardian?" "The Queen may have opened the Reef, but the hunt goes through me." "If it's the Techeuns you seek, they keep to themselves. Count yourself lucky." "Welcome to the Reef. You'll get used to the gravity." "If it had been up to me, we would have killed Skolas." "Let's get you a target." "We set up this outpost for the hunt. The Queen prefers it this way." "Let's see. Spinwards of this ship are the Factory Ships, then The Web, then the Tertiary Sun Core." "If you're not busy, I could use your help." "The Wolves spread far and wide, we have little time to waste." "The Queen commands you stay here for now, the rest of the Reef is... you'd find it strange." "I had a dream last night. I was hunting with the Queen on great white horses in a field of black flowers, and then... well... it was a good omen." "I visited Skolas in the Prison of Elders last night. The Queen will get him to talk." "I spoke again with Uldren. He is very cautious about you." "We don't have day and nights here in quite the way you're used to, it must be confusing." "Tell me about your Traveler, Guardian." "I never thought Skolas would return. I'll never understand why she keeps them alive." "You must have things to get back to on Earth." "Tell the Cryptarch we have need of his expertise." "They can't have just vanished." "We've got their trail now." "I don't trust him either but Variks has rarely been wrong since word of Skolas's return." "This was Variks's plan? We should be cautious, but I have to admit he's been very helpful lately." "The Queen won't accept failure and nor will I." "Guardian! If you're here to hunt wolves, come this way!" "Intel from the Techeuns? The Queen has them helping out too?" "I see Variks scuttling about. What's he planning now?" "I saw that one in a dream. The Black Garden." "If you're here to hunt Wolves, I can help you!" "Do not waste my time." "If the Queen wants it, then do it." "Don't worry. If this information turns out bad, I'll flush him out to space." "Who knows what they'll try. Be vigilant." "Get it to Variks. Fast." "On Venus. Are you sure?" "Give me the location of every Ketch you can. Skolas will surely amass a fleet." "Tell me, have you dreamed all this before?" "Some of you may know me! I am Petra Venj! I lead this Hunt!" "Guardians! Guests of the Queen! This way!" "So. The Wolf's ship Kaliks returns but who's its Kell." "Look at the servitor count around this one. Must be one of Skolas's new barons." "That Banner. Skolas's old crew." "Where. Where, where do you hide now Skolas?" "Why doesn't she just send in a slew of Harbingers? Have the Witches lost control of them?" "Open the channel to its Ghost. You got three Skiffs incoming, find some cover, we can't discern the house." "What is that? Are you watching one of Variks's prison fights?" "So the Techeuns fast-tracked you? You must be good." "Good, they'll regret starting that prison uprising." "Keep an eye on the Hunter with the Wolves cape." "Encrypted. If it's beyond the Cryptarchs' abilities we'll have to trust Variks." "Strange to see so many Guardians here." "Skolas! How did he get out of that prison?" "Scan Venus for every deployed Walker, have the Guardians silence them." "Issue a bounty, up the reward." "What's that Skiff? Doesn't look like the Wolves. Track it anyway." "Which one's this? Quite good for a Guardian." "Uldren sent this? Queen's brother proves clever again." "Don't look at me like that; it just makes me miss Cayde more." "Here to re-supply? Me too, then it's back to the field." "Uldren... you know better then to try to take the Watchtower... or, you did..."
"Don't lose heart; we'll find him." "Cayde approached me about taking care of the barons. He wanted me to join a team of his, called them... 'Cayde's Six'. I'm not sure if he was being serious." "Still nothing on the Reef networks." "Don't lose heart; we're in this together." "No response? Then pull them out. If we can't travel through the Ascendant Realm safely, leave it to the Guardians." "Cayde used to ask where the Awoken really lived, whether we had 'good loot'." "I blame myself for all this." "I can't excuse Uldren's crimes, but... sometimes, I miss him. I can't help it." Petra is performed and voiced by April Stewart. If the Guardian is an Awoken, Petra will refer to them as "cousin", most likely as a sign of respect towards another member of her race. In-game closeup of Petra Venj.